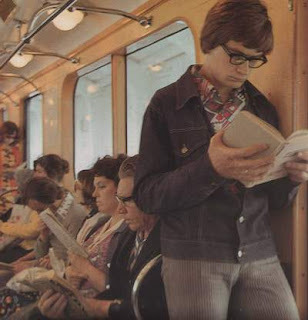 Intellectuals of the early decades now tell the present days younger generation how another super power used to exist in this world parallel and side by side to the present day super power. A power that kept the imperialists in their limits. A multipolar world then was much better than now, where nobody is there to prevent the western superpowers from opening newer fronts. If the socialist economy fell down in 1991, the capitalist economy is now falling down due to recession. On the one hand democratic countries like US, Russia, Greece and India are seeing various revolts and movements showcasing anger among the public for their government. On the other hand non democratic countries like Arab World and north Africa saw similar revolutions. Then which one is better? Non democratic like China, or Democratic like India? 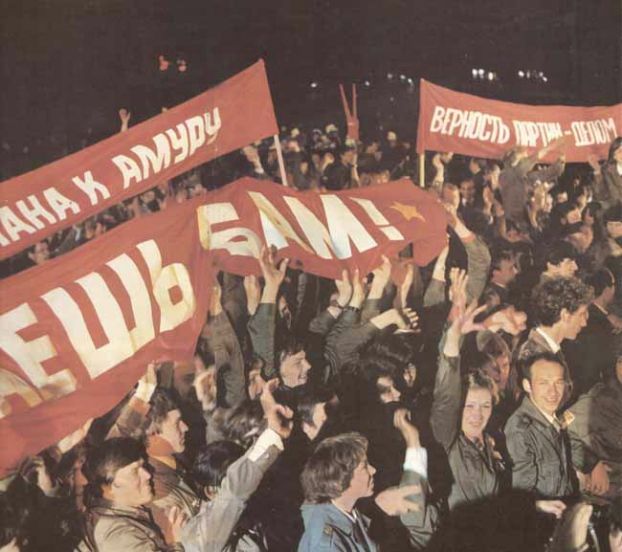 Without putting us in this long and old debate, we analyse the situation in the three countries of former Soviet Union after 20 years: Lithuania, Ukraine and Russia, which adopted the democratic government. A study by the Pew Research Center shows the result that after two decades of the collapse of USSR, the people in Russia, Ukraine and Lithuania are unhappy with the direction in which their country is going. Energy, Enthusiasm which was on top of of everyone after the collapse for the democracy and rights has now waned considerably in last two decades. While many believe that the changes which their country underwent all these years have done nothing good but given a negative impact to public morality, economy and law and order and standard of living. Russia, in the name of democracy has hardly enjoyed any benefits, as a stronger opposition lacks in the country which can give tough competition to powerful Putin. Ukraine has seen bad politics, interference by western diplomacy and colour revolution, whereas Lithuania, unlike Russia and Ukraine believe that changes in past 20 years have done good for them. 49% of the people are satisfied with the changes while 30% says no. 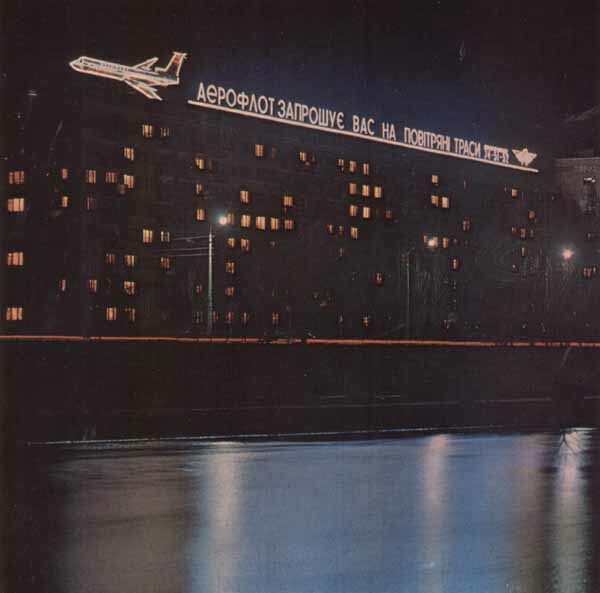 Despite the belief that capitalist economy is better than socialist only 42% of the Russians now approve a change to market economy, just before the collapse of Soviet Union in 1991 the count was 54%. The change of 11% fall. 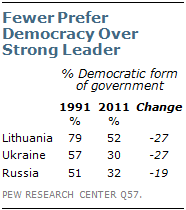 In Lithuania 76% used to approve in 1991 whereas now only 45%, In Ukraine this has slipped to 34% from 54%. There is a general feeling among these countries that the only benefit during these two decades were enjoyed by politicians and business elites, whereas common people were left behind, unlike Soviet Union where everybody was considered equal. The only thing which people like about democracy in their country is the improved judiciary and free media. The transparency in the coverage of Moscow protests by Russian media is indeed a colour of democracy. Public is able to protest freely against their own government is democracy unlike Arab world where military was ordered to attack their own civilians. 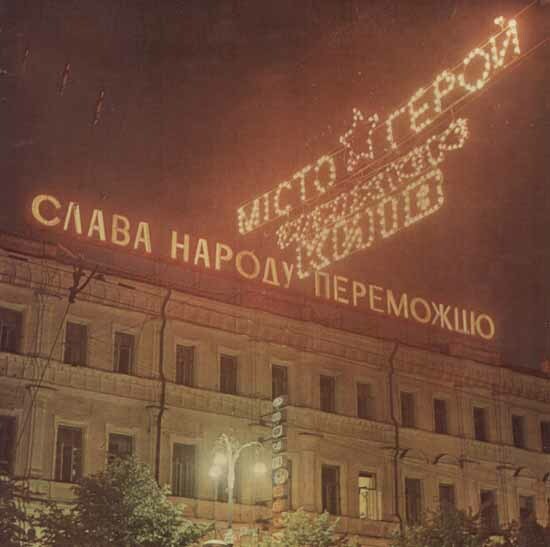 The public might be protesting against Putin as they don’t want him or his party yet again for another 4 or 8 years, but still if we look at the stats in 1991 just before the former Soviet Union was officially dissolved, there was a general optimism among the public for a change towards a multiparty system. Change to a Multiparty System can Solve the problems? Almost 61% of Russians then believed a change to multiparty system will be good for their society, now that belief has shrunk to 50%. Similarly, in Lithuania the count was 75% back in 1991, now only 52%. In Ukraine the optimism has slipped from 72% to 35%, but it is true that in all the three surveyed countries, the youth, the well educated class and the urban population only supports the change to multiparty system. Vladimir Putin has all the qualities of a strong leader, who has transformed the broken Russia into a powerful economy within past 12 years. He has brought back the respect to Russia which was lost after the break up of Soviet Union. Russia now is now leading in race to become a military as well as economy super power. Unlike strong leader of Arab world, Vladimir Putin is far more democratic also. Despite the protest against him, only 32% of Russian feel that they need a democratic form of government compared to 51% in 1991. When asked whether they should rely on democratic leader or strong ruler to solve their national problems only 3 in 10 Russians and Ukrainians chose democracy, whereas in Lithuania 52% prefer democratic leader now compared to 79% back in 1991. When asked whether people are happy with the current state of democracy in the country, a large number of the people in all these three countries showed dissatisfaction with the present state of democracy and how it is working in their country when compared to the results in 1991. Moreover, in Lithuania and Ukraine this belief has only changed only in past two years. According to the survey by Pew Global in 2009, 60% of Lithuanians said they were dissatisfied now this feeling has spread to 72%. In Ukraine the same unhappiness has risen from 70% to 81%. Just when the world lost confidence in socialist economy after the collapse of Soviet Union, these three countries lost the confidence in capitalist economy after the recession. 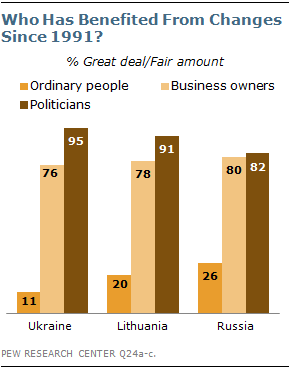 76% of Lithuanians were optimistic about switching to a market economy in 1991, now only 45% feel the same way. 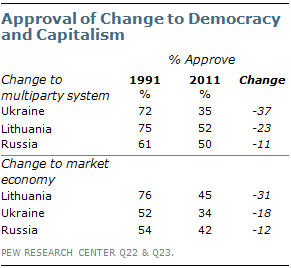 Among Ukrainians, optimism fell from 52% in 1991 to 34% after 20 years. Although, 42% of Russians currently endorse the free market approach, a 12-percentage-point drop since 1991, eight points of which occurred in just the last two years during recession. Slipping confidence in the capitalism is due to the reason that the people don’t feel that their country is doing good in economy. In all the countries those who have not seen the life in Soviet Union or were too young when the giant collapsed are only the people who support capitalism and democracy. 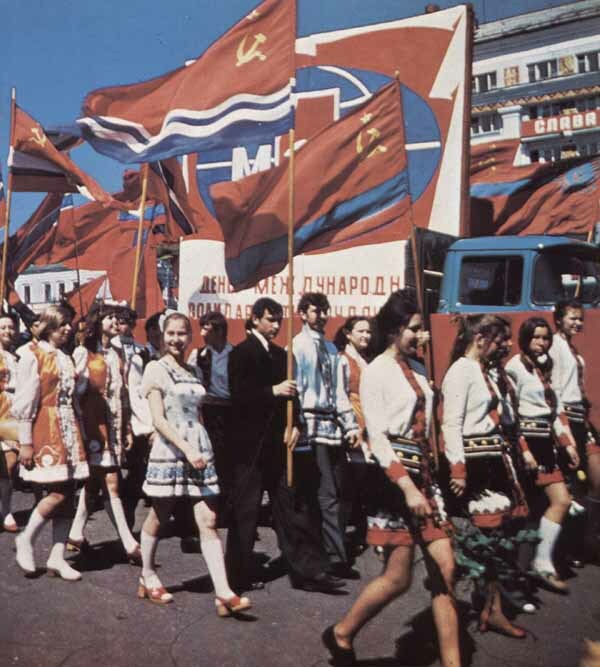 Russians believe that it is a great misfortune that Soviet Union now no longer exists. While only 36% disagree to this belief. US and Russia who is better? All the three countries surveyed considers EU important for economy and development and hence EU enjoys positive views, whereas NATO is considered as America’s military expansion towards these countries rather than a security network. Lithuania being involved in EU and being a member of NATO gives plus points to both the organization. While 49% of Lithuanians think joining EU is a good thing, 31% doesn’t find any change, whereas 8% feel it is not a good thing. Lithuania being a member of NATO also backs the idea of Ukraine joining the security group. 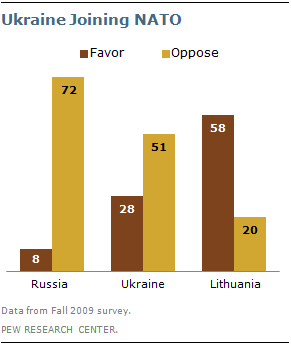 Whereas 72% in Russia and 51% in Ukraine oppose Ukraine joining NATO. It is true since the day the Soviet Union fell down, democracy ended in the world. 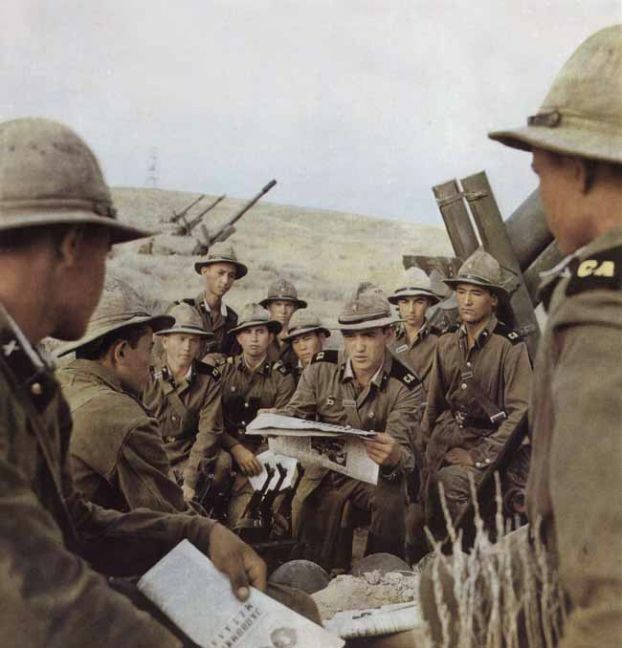 After the collapse of Soviet Union we have seen more wars on small countries than ever before. But it is true as well that the world was on the brink of a real big war which could have turned into a nuclear war when both the super powers existed side by side. The time when US is understanding that soon its supremacy could be taken over by Asian giants, US is welcoming warmer ties with as many countries possible. At this time rise of Russia, which is more open and transparent than before along with China, Europe and possibly India and Japan will lead us towards a multipolar world. Which would be more complex but peaceful. Участие США в кризисе в Украине. Больше беспокойство или решение проблем? US involvement in Ukraine crisis. More disturbing or problem solving?